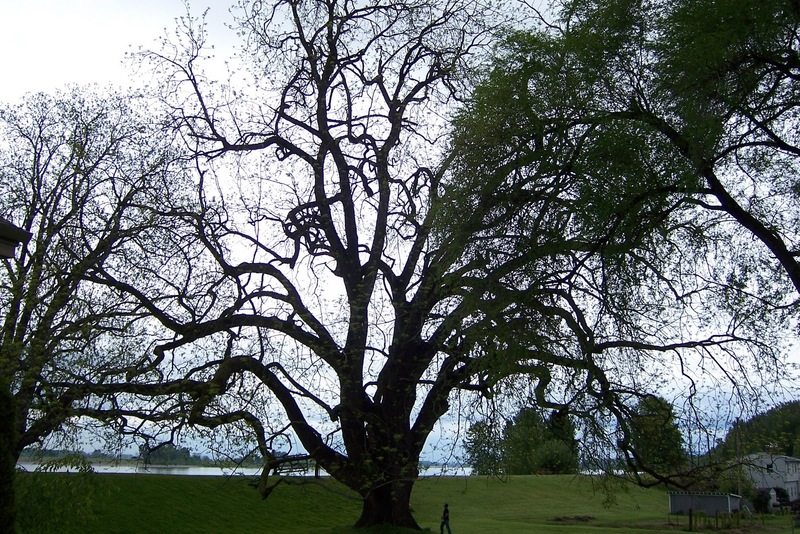 What may be the largest Black Walnut tree in the world on Sauvie Island, Oregon. Note the man standing to the right of the base of the tree. This very large deciduous tree is a popular nut and lumber tree. 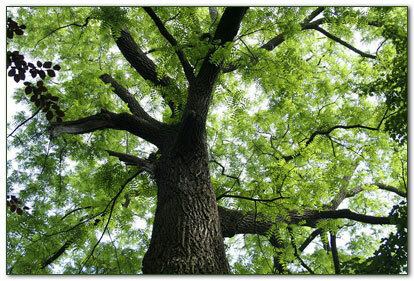 There are 21 species of tree in theJuglans genus. The most commonly grown tree for nuts is the English or Persian Walnut. The Carpathian Walnut is a more cold-hardy variety of the English/Persian Walnut, but many people consider them interchangeable. 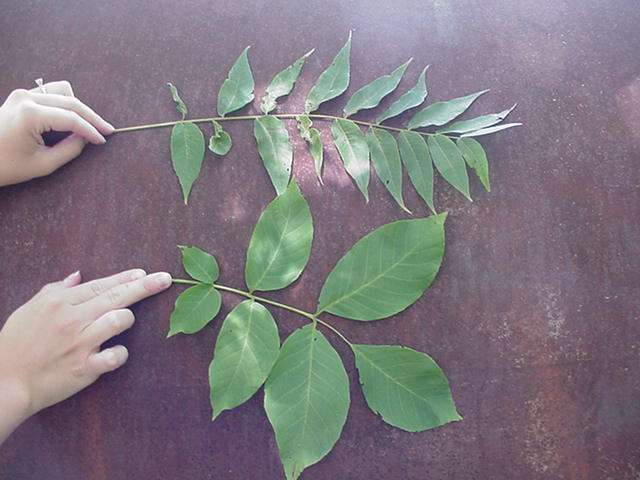 In the United States, the Eastern Black Walnut is a very common tree for nuts, which is prized for its stronger flavor but much more difficult extraction; however, it may be even more valued for its high quality wood from a relatively fast growing tree. Walnuts are great shade trees, great nut producers, and may be considered a wise investment for your children or grandchildren. 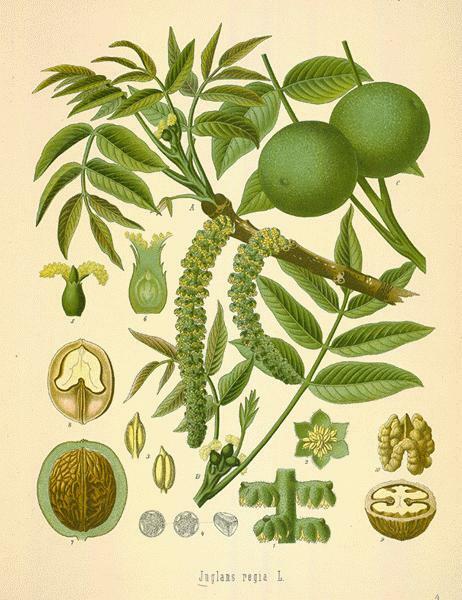 The English/Persian Walnut is native to Central Asia. 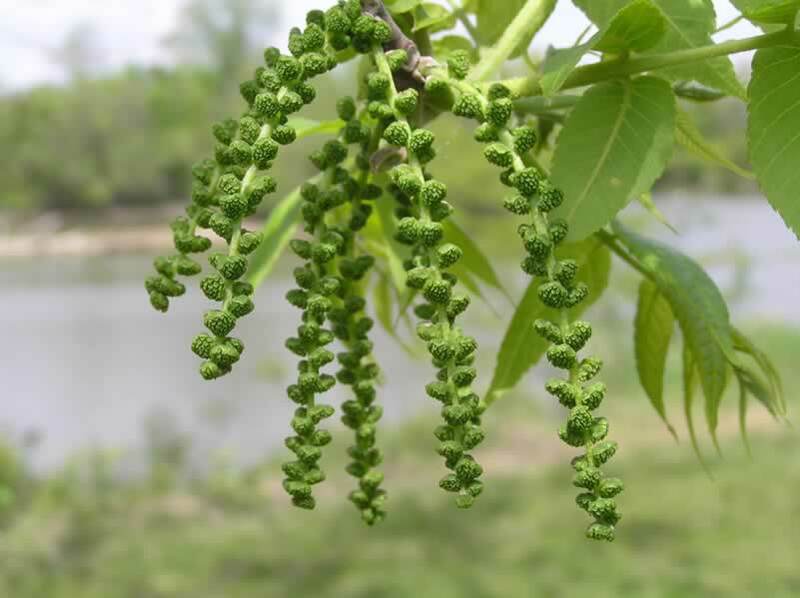 Alexander the Great introduced this tree to Macedonia and Greece in the 4th century B.C. The Romans continued this spread throughout Europe, England, and northern Africa. It was introduced to the Americas in the 17th century by colonists. 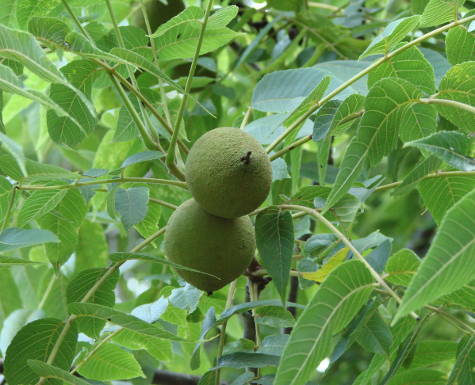 The Black Walnut is native to the eastern United States. 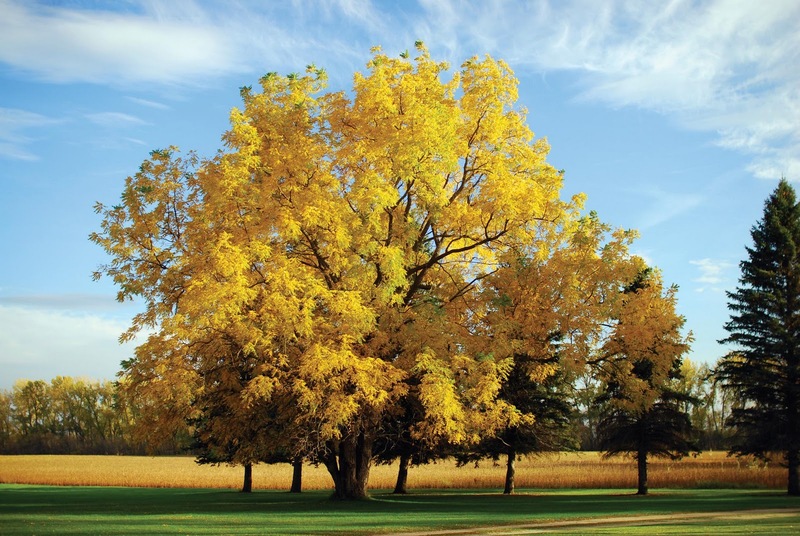 It was introduced to Europe in 1629 to be used primarily as a high quality wood tree. It is more cold-hardy than the English/Persian Walnut. Beautiful Black Walnut in autumn. Hulls can make a brown dye for yarn, cloth, etc. and can even be used as a wood stain. English/Persian Walnuts about to break from their husks while still on the tree. Black Walnuts ripen in their husks, but the husks do not break open on the tree. 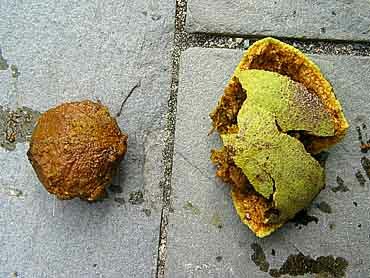 A ripe and recently husked Black Walnut nut – not an easy process! 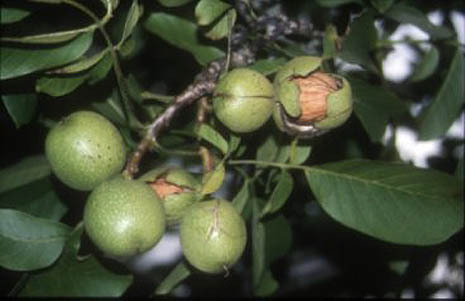 English Walnut nuts will fall from green husks when ripe. Usually pick nuts from the ground or from nut catching nets if you place them and then shake the tree. Commercial nut producers will have tree-shakers. Black Walnut nuts fall with husk in place. 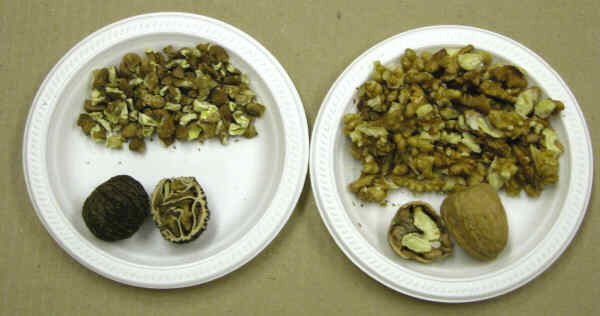 The husk must be removed to get to the nut which must be shelled to get to the meat. They nuts taste better when the husk is still green and not black. There are many methods to extract the nut from the husk, but a hammer is often used. Once the nut is extracted (this process will stain everything), toss out nuts that are black and oily. Drop the rest of them in a bucket of water, and toss out the ones that float. Drain the nuts and lay them out in a warm, dry location. You can let them cure for over a month. Toss out any that become moldy. Then crack the nuts – a mounted vise works well – but be warned that cracking Black Walnut nuts can cause sharp shells to go flying. All this work is worth it if you’ve ever really compared the taste of Black Walnuts with the more mild English/Persian Walnuts. English/Persian Walnut bark has wider grooving. The flowers of the walnut tree. Looking up into a Black Walnut. Moisture: Medium moisture. The Black Walnut can tolerate less moist soils. Walnut roots and leaves produce juglone, a chemical that inhibits the growth of certain plants. Make sure that surrounding trees and underplanted plants can tolerate juglone. 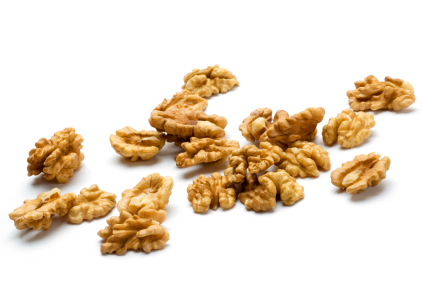 Black Walnuts can be difficult to shell – just make sure you have a heavy-duty nut cracker. I’ve read about people who just run over them with their car to minimize the hassle, but the hassle is worth it! Certain Walnut specific diseases exist. Choose disease resistant varieties to avoid these problems. 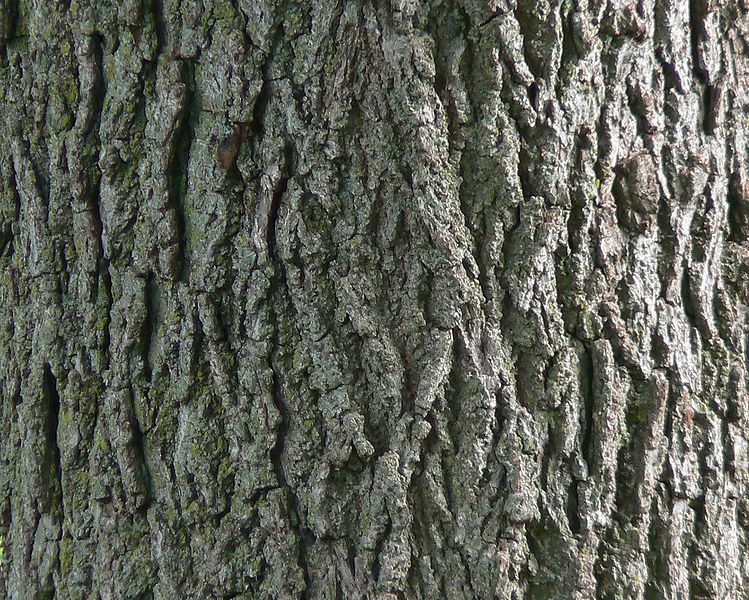 Rodents can be a problem for seedlings and young trees – they like to eat the bark. Usually grafted from improved varieties. Walnuts grown from seed or wild stock typically have nuts that do not taste as good, and they also take longer to start producing a harvest; however, they are just fine for wood. If starting from seed, they will need 90 days stratification. If planning on using as lumbar, then prune for a strong central leader. Otherwise, they don’t need much once established. This is a large tree. Only raise it if you have the space or plan on cutting it down before it gets too large.